Caption: a cluster of galaxies at a distance of 2 billion light years, each galaxy containing 10s or 100s of billions of stars. 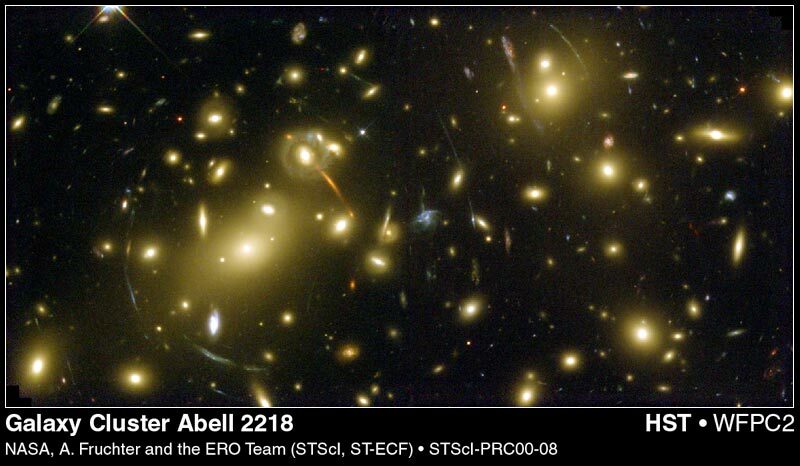 The arclets of light are still more distant galaxies whose images are distorted by the gravitational field of the foreground cluster, as predicted by Einstein. Image courtesy of the Hubble Space Telescope. This presentation is specifically geared to the interests of the general public. all - to find new mysteries we have yet to dream of. This is a technical presentation, but open to the community. The colloquium announcement flier is here. Caption: The "death shroud" of a low mass star like our Sun, otherwise known as a planetary nebula. 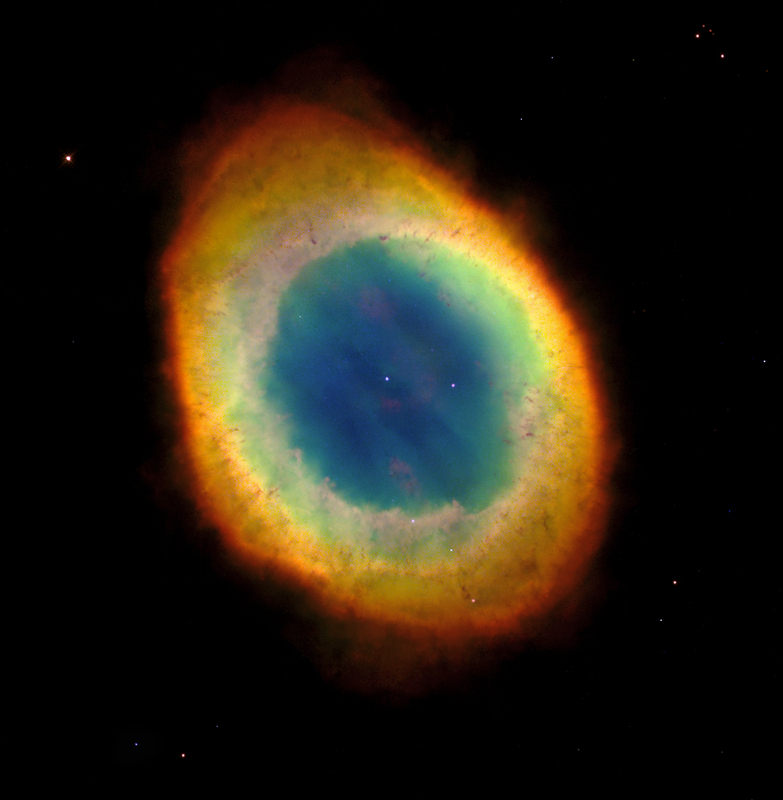 Dubbed the "Ring Nebula," it lies 2300 light years away in the constellation Lyra. This shell of glowing gas is the former envelope of the star at center, thrown out into space at the end of its life. The central stellar remnant has contracted to become what is known as a ``white dwarf,'' just a bit larger in size than our Earth. The energetic light from its hot surface excites the atoms in the surrounding shell of gas to glow at different wavelengths of light. Image courtesy of the Hubble Space Telescope. James B. (Jim) Kaler, Professor of Astronomy, earned his A.B. at the University of Michigan, his Ph.D. at UCLA, and has been at the University of Illinois since 1964. His research area, in which he has published over 100 papers, involves dying stars. Prof. Kaler has held Fulbright and Guggenheim Fellowships, has been awarded medals for his work from the University of Liège in Belgium and the University of Mexico, and most recently was selected to give the Armand Spitz lecture by the Great Lakes Planetarium Association. He has written for a variety of popular and semi-popular magazines (including Astronomy, Sky and Telescope, and Scientific American), was a consultant for Time-Life Books on their Voyage Through the Universe series, appears frequently on Illinois television and radio, and has produced several books, including Stars and their Spectra (Cambridge), Stars and Cosmic Clouds (Scientific American Library), The Ever-Changing Sky (Cambridge), Astronomy! A Brief Edition, (Addison-Wesley), and the recently published The Little Book of Stars (Copernicus) and Stars at the Edge (Cambridge). He is a current member of the Board of Directors of the Astronomical Society of the Pacific, and is a past president of the Board of the Champaign-Urbana Symphony.